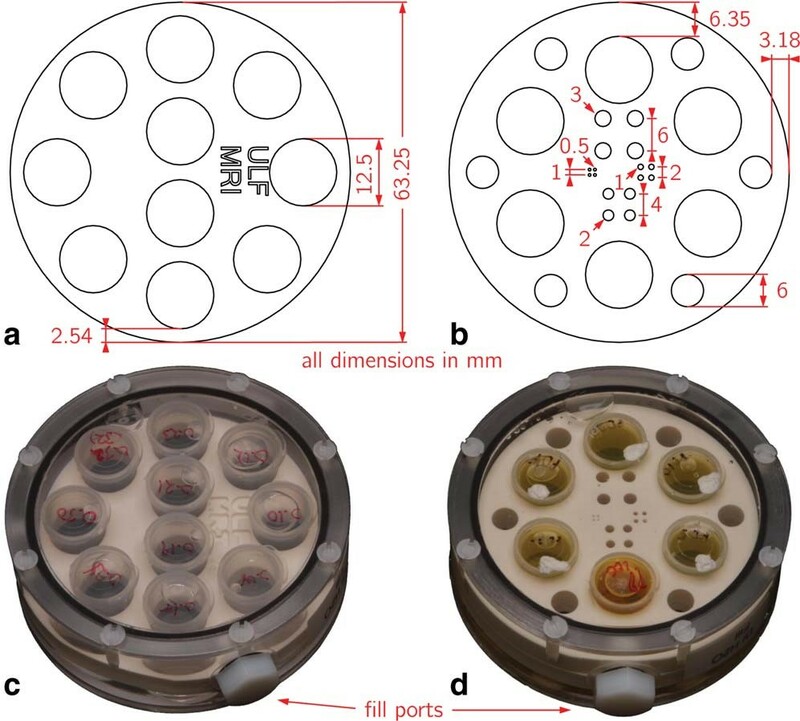 The scope of MRI is expanding with the development of both ultra-high field (14 T) and ultra-low field (0.1 mT) scanners not only for biomedical applications but for in situ materials characterization. In addition, entirely new types of magnetic imaging modalities are being developed, including magnetic particle imaging (MPI), EPR-enhanced MRI, and micro fabricated sensors and contrast agents visible in an MRI, to name a few examples. 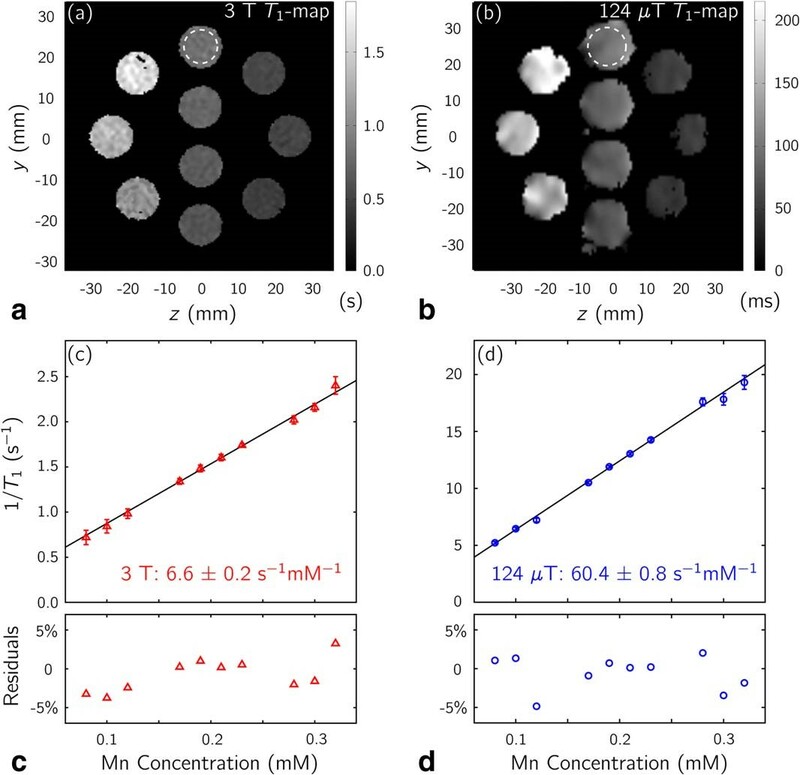 These advances will enable the development of new types of magnetic imaging agents that are useful not only for image enhancement but may have molecular and functional imaging capabilities, as well. The program focuses on techniques that challenge the current methodology of MRI to improve sensitivity, resolution, affordability and portability. MRI systems are widely used for clinical diagnostics where imaging is typically done in high-field magnets ranging from 1.5 T to 7 T to achieve a manageable signal-to-noise ratio needed for short imaging times (few minutes) and high resolution (1 mm or less). Ultra-low field (ULF) MRI (100 µT) has several potential advantages: (a) narrower instrumentation line widths; (b) greater T1 contrast; (c) minimal susceptibility artifacts due to metallic implants or the presence of air; (d) air core B0, B1, Gx, Gy and Gz coils with relaxed uniformity and power requirements (100 ppm versus 0.1 ppm, less than1 kW versus 10 kW or more). Since its discovery in 1953, dynamic nuclear polarization (DNP) has provided a powerful means for enhancing the proton resonance signal. The majority of recent research effort has focused on high magnetic fields, leading to many transformative experiments. Initial research into solution DNP in low magnetic fields has also been very exciting, especially in light of models predicting the magnitude of DNP enhancement at very low magnetic fields could be an order of magnitude greater than γe/γH = 658x theoretical limit at high magnetic fields. There are many instances where use of high magnetic field NMR is either unnecessary or impractical due to cost and large instrument footprint. Low magnetic field NMR instruments are considerably less expensive to build or purchase, and can be made portable for application to a greater variety of materials in a wide variety of environments. In many cases, simple electromagnets or small permanent magnets are sufficient to generate the required fields. Magnetic fields less than 100 mT (4.26 MHz) are optimally suited for extremely heterogeneous mixtures containing both liquids and solids. Internal gradients created by differences in liquid/solid susceptibility scale with main field strength, and are smaller in the low field regime. We are developing compact AC susceptometers for real‐time monitoring of the conversion of precursors to magnetic nanoparticles in batch or continuous flow reactors. The goal is to rapidly assess specific magnetic performance parameters that are relevant to the final intended use of the magnetic particle solution. Ideally measurements on small sample aliquots (less than 1 μL) that are broadband and take a short time to perform (less than 1 s) are needed. Also, the physics package should be easily adaptable to the reactor as well as typical micro pumps or syringes for fluid control. Magnetic particle contrast agents can be used to improve the sensitivity of ULF MRI. Here we describe an instrument with the primary purpose of characterizing new types of contrast agents for use in ULF MRI. Specifically, we describe the design and performance of a non-cryogenic ULF MRI system based on Faraday detection operating at 5300 Hz (124 µT). 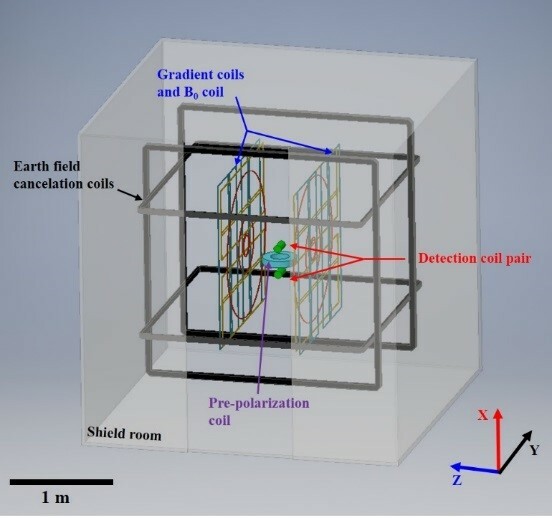 The instrument is based on a previously published design with novel modifications including a more efficient gradient coil design, differential Faraday coil pair of detectors, and a shielded pre-polarization coil allowing for room temperature operation without the need for a SQUID detector (see Fig.1). Initial imaging results demonstrate an ability to observe vials (Φ=14 mm) filled with DI water (Fig. 2) and filled with different concentrations of magnetic particles (Fig. 2), which are clearly identifiable in 2D ULF MRI. Figure 1. ULF MRI system showing differential detection coil on either side of the shielded pre-polarization coil. Figure 2. 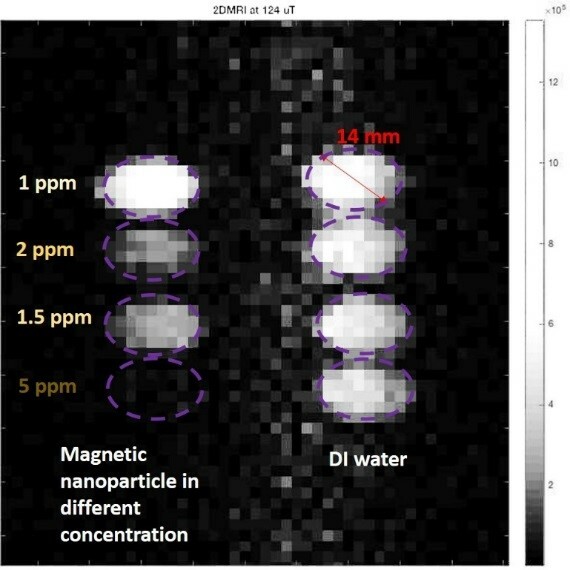 2D ULF MRI image with 4 vials of DI water (right) and 4 vials of diluted magnetic nanoparticle solutions (left) with different concentrations 1 ppm, 2 ppm, 1.5 ppm and 5 ppm from top to bottom. A gradient echo sequence was used with a pixel resolution of 1.4 mm × 2 mm and field of view (FOV) of 3 m × 3 m, with an applied magnetic field (B0) of 124 µT and gradient fields of 4 µT/cm. Image time was 1.6 hrs. 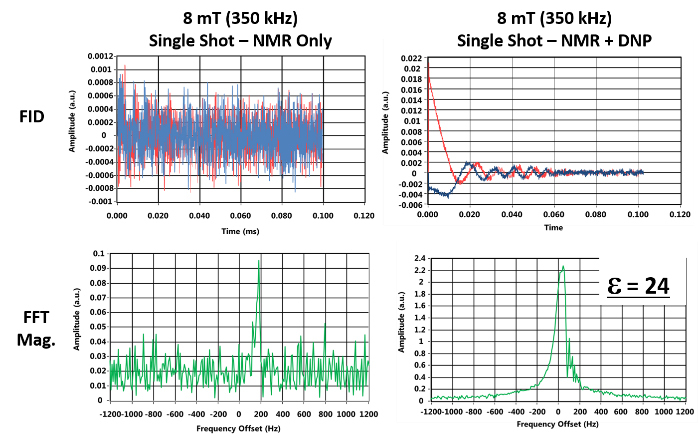 We have constructed a digital DNP spectrometer with commercially available components designed to study the Overhauser (solution) effect at magnet fields from 230 µT - 50 mT (10 kHz-2 MHz/NMR, 6.6 MHz-1.3 GHz/EPR). The system is based on PXI architecture. An embedded controller containing the CPU, hard drive, Ethernet and peripheral ports removes the requirement of a separate PC. We developed a magnetic resonance console and front panel GUI for single pulse NMR and DNP experiments using commercial instrumentation control software. Single pulse saturation recovery experiments to measure T1H can be carried out in the presence/absence of the radical to access the DNP leakage factor, f. The maximum frequency of operation for 1H with the current arbitrary waveform generator (AWG) card is 12.5 MHz. 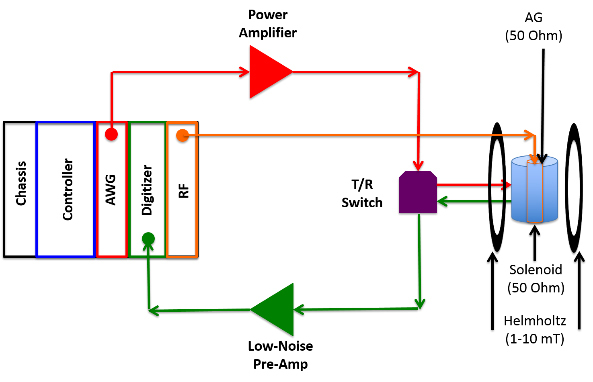 The operational range of this instrument could be extended to 0.3 T by simply replacing the current RF generator card with one where maximum output is in the 8-9 GHz region. Figure 4. Comparison of the single shot experiment with and without DNP enhancement. The prototype ULF-MRI phantom established a reference object for comparison of ULF-MRI scanners, as well as a quality control measure for any single site. 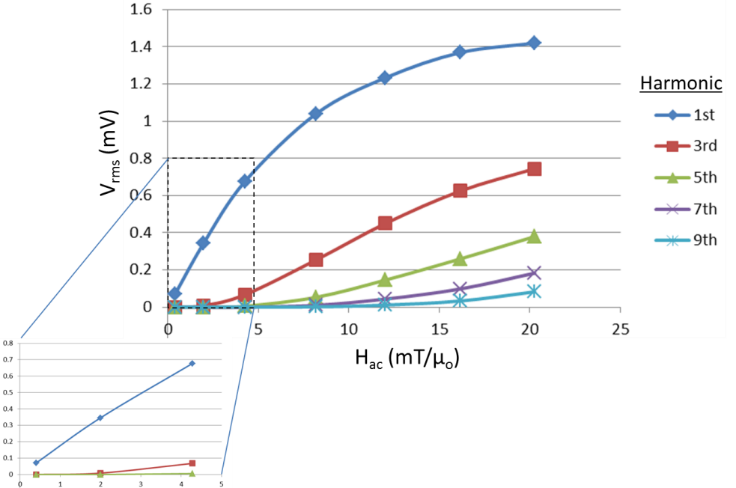 T1 values of MnCl2 solutions demonstrated the expected linear increase in relaxation rate with increasing Mn concentration, and the longitudinal relaxivity in the µT regime matched previous literature results. Proton density measurements indicated a spatial dependence of signal intensity; mapping this variation with identical solutions allowed for spatial corrections. Applying these corrections resulted in proton density measurements that exhibited excellent linearity. Finally, the resolution inset provided a means to characterizing the resolving power of ULF-MRI, allowing for determination of achievable resolution for a given scanner and pulse sequence. Figure 5. Schematics (a,b) and photos (c,d) of ULF-MRI phantoms. Vials hold solutions that provide different values of proton density and relaxation time, T1. The small holes provide a means to assess spatial resolution. Figure 6. Comparison of 3 T and 124 T T1-mapping results of MnCL2 solutions. MnCl2 concentrations increase from top to bottom, and from left to right. The 3 T image (a) yields the 1/T1 values seen in (b) after drawing circular ROIs in the appropriate vials. The 124 T results (c,d) indicate much shorter relaxation times for the same solutions, yielding a higher relaxivity (relaxation per unit concentration) than at 3 T.
Here we describe a susceptometer that measures the harmonic response of a magnetic nanoparticle solution when it is driven towards saturation. It is designed to bench mark the performance of the solution as a potential contrast agent for magnetic particle imaging (MPI) applications. 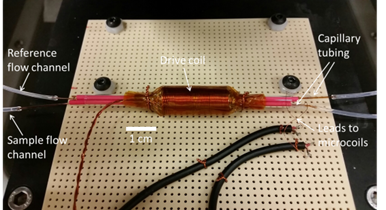 Figure 7 shows the prototype physics package for the suceptometer where two nearly balanced micro pick‐up coils (59 turns, 40-gauge copper wire) wrapped on silica capillary tubing (OD 661 μm, ID 532 μm) sit inside a common drive coil for low noise differential measurements. Figure 8 shows the differential harmonic response voltage (Vrms = Vsample‐Vref) between the sample and reference pick‐up coils of a solution of magnetic ink (30 ± 15 nm particle diameter, χi = 0.45) as a function of the magnitude of a 10 KHz AC drive field. Figure 7. Microfluidic ac susceptometer breadboard prototype. Figure 8. Harmonic response of a magnetic fluid measured as a function of AC field magnitude. Information on postdoctoral research opportunities here.